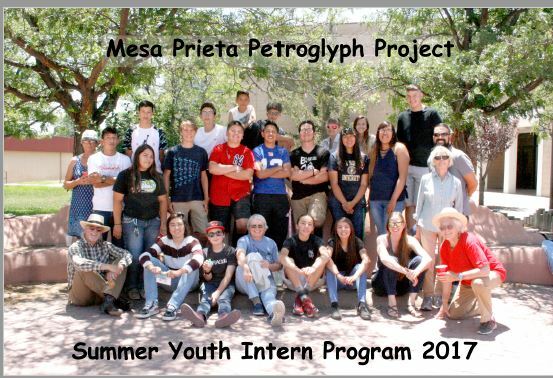 2017 Summer Youth Intern Program participants and adult volunteer mentors on Mesa Prieta. 4th - 7th Grade School Curriculum - "Discovering Mesa Prieta"
MPPP office and in the library. Day-to-day office duties and activities to support the project are performed by volunteers working with the Project Director. 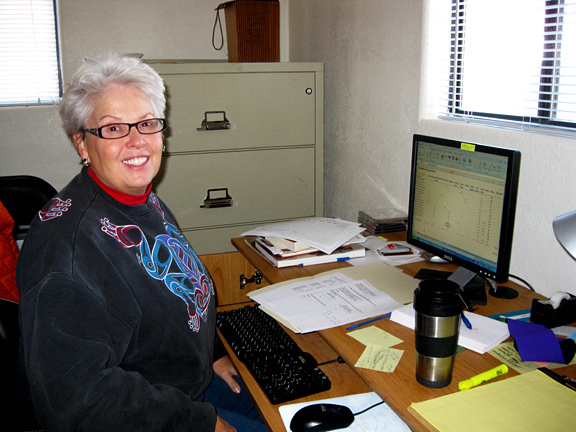 Tasks include answering phone calls and emails, data entry, responding to recorder, surveyor and docent needs, collecting mail, conducting supportive tasks associated with curriculum and youth programs, working in the resource library, filling and mailing merchandise orders as well as numerous other tasks. Office volunteers may work from once a week to once a month and perform tasks they are familiar with and comfortable in doing. 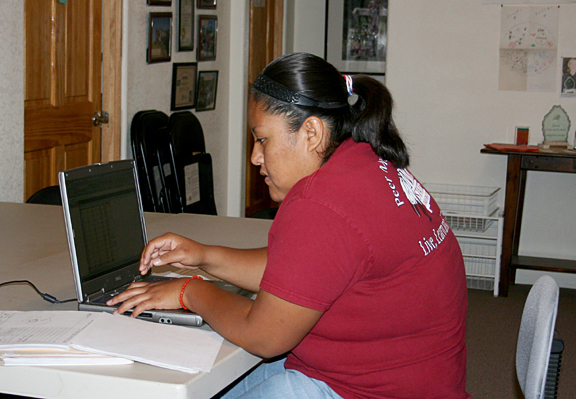 Aileen Cruz, a veteran Summer Youth Program Intern and Young Adult Mentor with the summer program, volunteers in the Mesa Prieta office entering BLM recording data. Aileen is from Ohkay Owingeh and is the first Pueblo Miss NMSU Native American. Maintenance and upgrades are conducted regularly on each of the six Wells Petroglyph Preserve trails. Volunteers pitch in with rakes, shovels, chainsaws, pruners, wattles, straw bales and other implements to make the trails safer and to reduce erosion on the Preserve that results from natural elements and tour traffic. Approximately 100 docent-led tours are given each year on the Preserve and the traffic contributes to wear and tear on the fragile terrain resulting in erosion and possible boulder movement. Remediation is conducted during regularly scheduled trail maintenance work days. Volunteers bring their own tools and donations of trail stabilization materials are greatly appreciated. 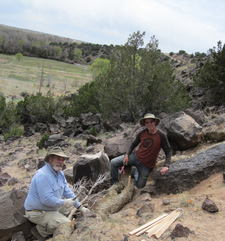 Carl Calvert and Bob Greene place wattles for erosion control during a trail maintenance day at the Wells Petroglyph Preserve. About ten volunteers are trained by New Mexico Site Watch to monitor their assigned areas monthly on the Wells Petroglyph Preserve. Volunteers receive training from the State NM Site Watch Program, then are oriented to sites on the Preserve to monitor monthly. Unfortunately vandalism has occurred on the Preserve and is a continuing concern. Each year, the project sponsors a Volunteer Appreciation Picnic on or near the mesa for more than 100 volunteers with the project. Various volunteer recognition awards are given as well as other tokens of appreciation. The Project values each and every volunteer and strives to thank them for the many hours worked, miles driven and other contributions they make to the project. 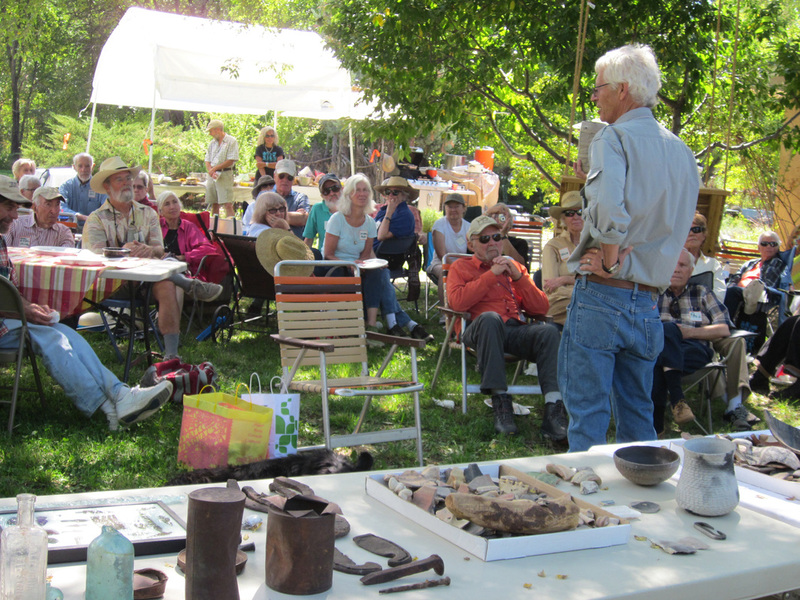 Chuck Hannaford, Project Director with the Office of Archaeological Studies, displayed and discussed the extensive OAS demonstration collection of New Mexico Native American Artifacts at the annual MPPP Volunteer Picnic.